With just 10 minutes of prep work required, this six ingredient Slow Cooker Pork Tenderloin with Raspberry Chipotle Sauce is one of the easiest dinner ideas to grace your table! Drum roll, please! 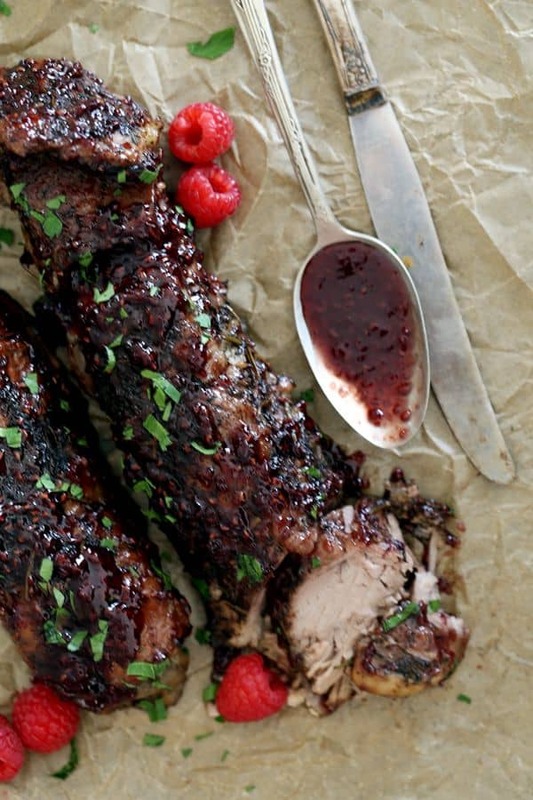 The winner for easiest dinner ever goes to this Slow Cooker Pork Tenderloin with Raspberry Chipotle Sauce. And the aroma wafting through your house as it cooks? Totally gold medal worthy. While testing this recipe, I started it around breakfast time and by lunch, my menagerie was constantly asking what was cooking and if it was going to be our dinner. Let’s give a gold medal to this mama while we’re add it, shall we? This pork tenderloin is easy enough for any weeknight yet so pretty that it’s equally amazing when served to dinner guests. We’ll just keep it our little secret that it’s easy enough my six year old could make it. Well, if I allowed my six year old to operate the oven broiler. That’s totally not going to happen anytime soon. But the slow cooker part? She could do it blind folded! Garlic and spices are stirred together and create a delicious crust on two pork tenderloins before they’re cooked low and slow in the slow cooker. SIDE NOTE: If you’re looking for an amazing slow cooker, I can’t recommend the one I chatted about in this recipe enough. I mean, the fact that it’s non-stick and is a breeze to clean is amazing in and of itself, but it also will brown, simmer and steam as well. I have three slow cookers and this is the only one that has earned residency in my small kitchen’s limited cabinet real estate. 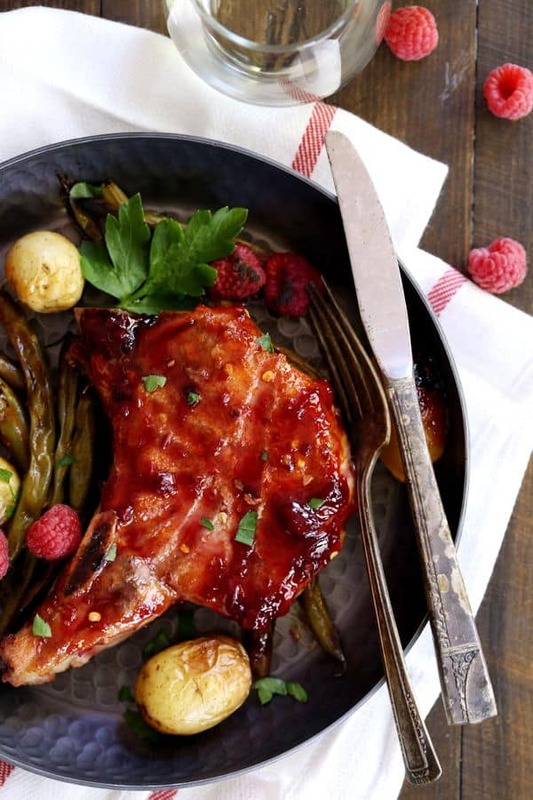 When the pork emerges from the slow cooker, it’s then slathered with Raspberry Chipotle Sauce from Robert Rothschild Farm. Since we’re giving them out, they should get a gold medal for this sauce, too! Sweet, sun-ripened raspberries are blended with smoky, spicy chipotle peppers. A perfect blend of sweet and spicy. Then, under the broiler it goes for just one to two minutes until the sauce caramelizes. Lather, rinse, repeat. Or rather, this is repeated on the other three sides so that you have the best of both worlds. A slow cooked pork tenderloin that also has a delicious, caramelized crust. And all with less than 10 minutes of work! In a small bowl, stir together garlic, rosemary, thyme, sage, salt and pepper. Set aside. In a 6 quart slow cooker, add pork tenderloins. Season both sides with garlic and spice mixture. Remove pork from slow cooker to baking sheet. 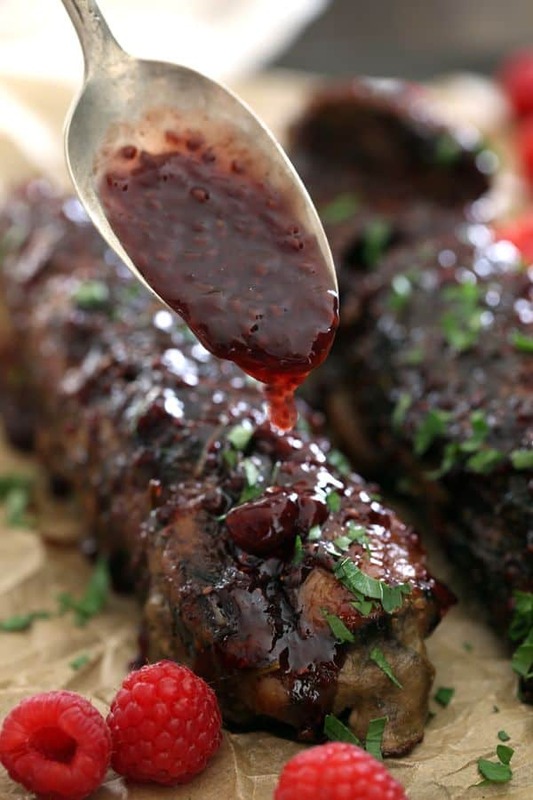 Spread 1/4 cup of Raspberry Chipotle Sauce on one side and place under broiler for 1-2 minutes or until caramelized. Repeat with three additional sides. Feel like joining the gold medal club? I thought so! 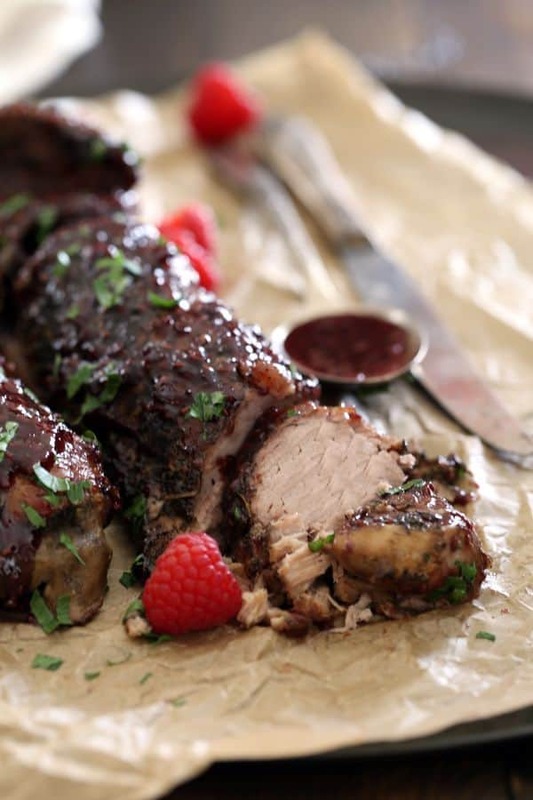 You’re destined to be at the top of the podium when this Slow Cooker Pork Tenderloin with Raspberry Chipotle Sauce is on the dinner menu. And yes, I’ll freely admit that I’ve been watching too much Olympic coverage this summer. Thus the medal analogies. Although I think I’m way more likely to win a medal for making dinner than the pole vault. I mean, my mind just can’t even comprehend how you compete in that event! Melanie, thank you so much for this recipe. 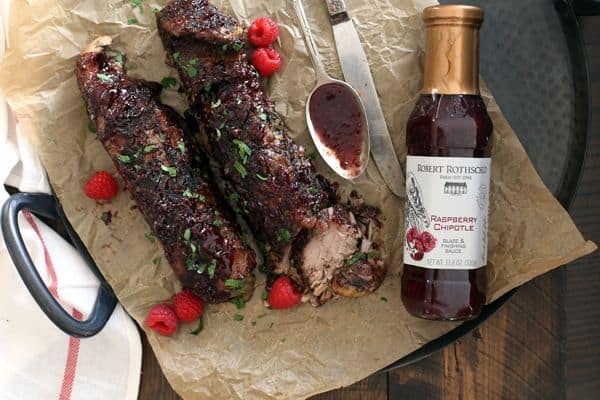 Many years ago i made a raspberry chipotle pork recipe (Emiril's recipe), made the sauce from scratch and it was awesome. We have since found a bottled sauce that we love and now use. I am making tomorrow and was trying to figure what liquid to put in slow cooker to cook it with. Now knowing i can do it without the liquid is a game changer. Can't wait to try this tomorrow.P.S. my slow cooker is now 25 years old but i can actually put the pan on the stove to brown meat first. I know it will be time for a new one soon so thank you for the reccomendation, looks like it will be my next slow cooker. Hi, Piper - I haven't tested this recipe on high so I can't say for certain. If you have the time, I'd definitely stick with the posted time on low as meat tends to be more juicy and flavorful that way. 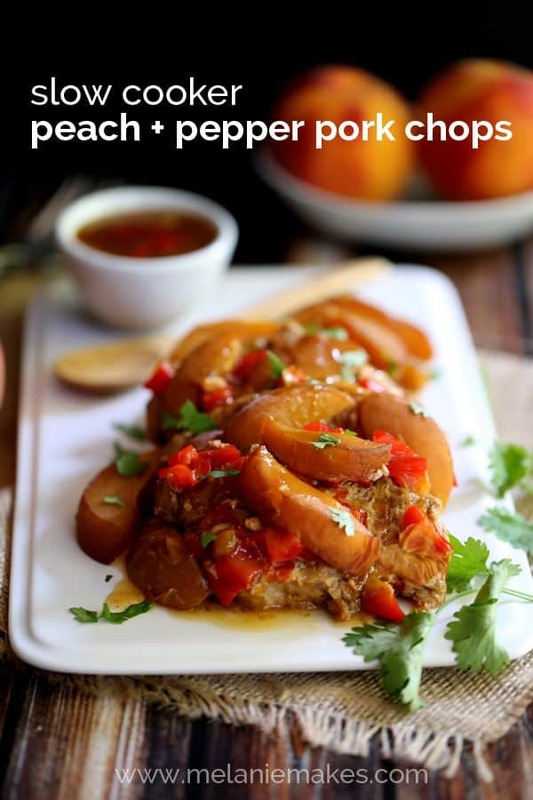 This looks great, but always thought you needed liquid in a crock pot, the pork is OK with just the seasonings? Hi, Kathie - Yes! No liquid needed, it will self baste. :) Let me know what you think if you give it a try! 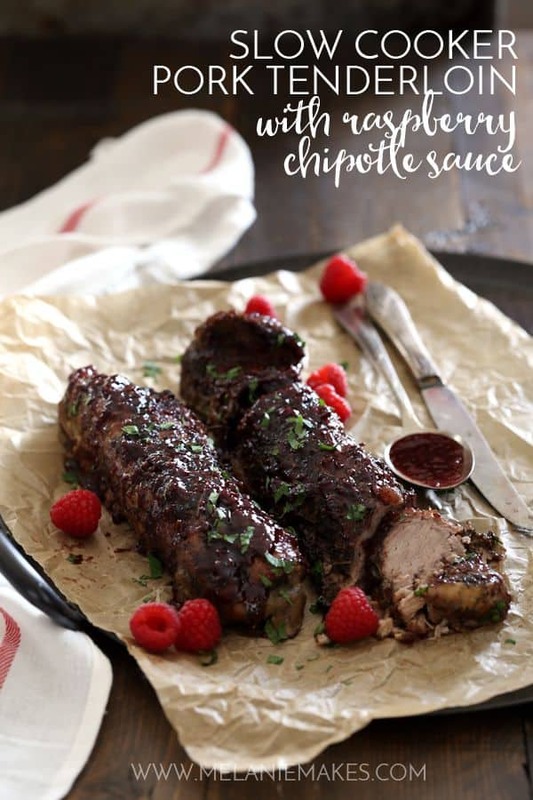 Raspberry and chipotle go so perfectly... love this! I love pork tenderloin but I never think to make it in my slow cooker. This recipe looks and sounds so good, I'll definitely remember it the next time I make pork tenderloin. 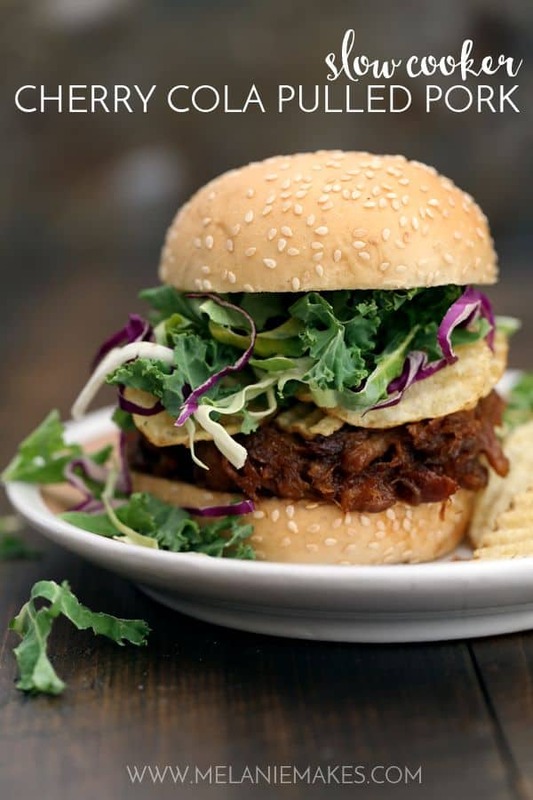 It's so nice how easy the slow cooker makes this recipe. Definitely give it a try Joanie! I love dinners that are easy to make! Especially when they are crock pot meals! This looks amazing, it doesn't even look like it was made in a slow cooker. What a great meal to have during back to school. You're so kind, thanks Michelle! Slow cooker meals have been a game changer for me this Summer and I am totally adding this recipe to my ever-growing collection! I love chipotle anything, so I have to try this! It looks mouthwatering! It definitely disappeared fast at our house, Dee! What is the brand of slow cooker. My crockpot cooks too fast! Hi, Karen - It's a Cuisinart and it's an absolute game changer! You should be able to click on the link and it'll take you right to the product page. Let me know if you have any other questions!